I made this card last week, but had no occasion to share it being very sick all week. I feel a bit better today, so I'll finally post it... I was making it with fever already, and for that reason I guess I totally forgot to make it easel card for Robyn's Fetish Challenge. I've used stamp Tea Cup Pansies from sponsor Fred, she said and coloured it with copiсs. 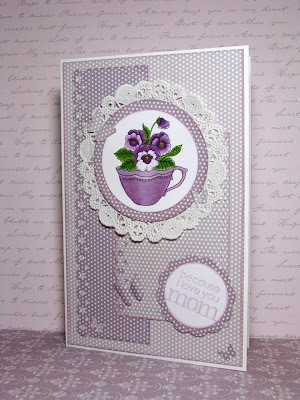 I've also used Tilda papers. 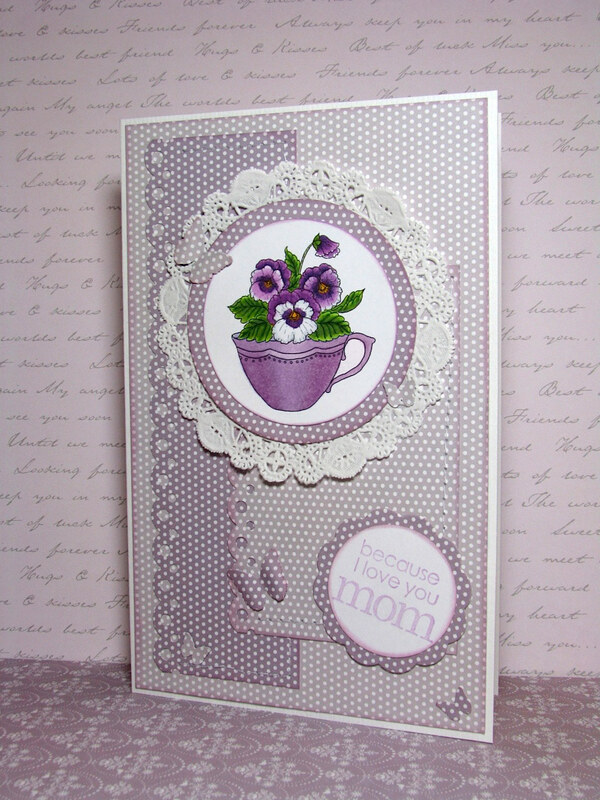 I distressed all the edges with Milled Lavender Distress Ink. Sentiment is from the small set I bought once in Michaels. Штамп на листівці Tea Cup Pansies люб'язно надав спонсор Fred, she said. Я розмалювала штамп маркерами копік. Папір, вочевидь, від Тільда. Краї я затонувала лавандовим дістресом від Тіма. Метелики з нового дірокола, який я чомусь завжди собі шкодувала купити. №2 Maria (Маруся) !! Вітаю, Марусю! Thank you for stopping by and taking your time to comment! Дякую, що заходите й коментуєте, бо я дуже-дуже люблю читати ваші коментарі! Лиличка, открытка такая няшечка, обожаю горошек, мне она так нравится. Она чудесная. Я тебя очень прошу - береги себя, тебе нельзя болеть. Удачи тебе. Ура! Вітаю Марусю з виграшем такої солоденької цукерочки!!! 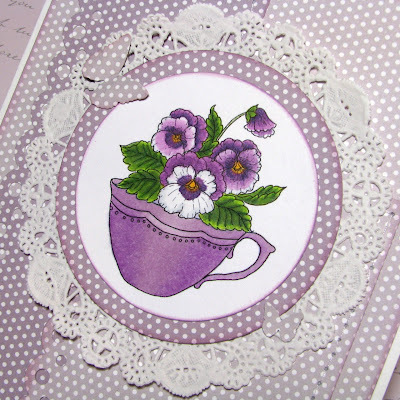 Lovely card, love your design and the polka dots are yummy! Thanks so much for playing with us at Paper Creations Ink & OSAAT. This is Absolutely Gorgeous!!! Love the gorgeous image, the dps, the colour scheme is just perfect. 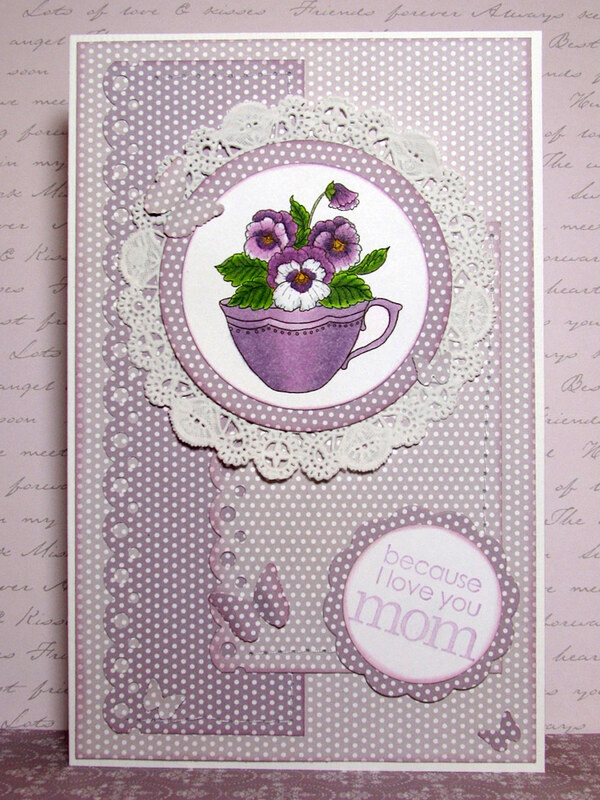 Love the layout and the embellishments. Coloured perfectly. Thanks for joining us at Sparkles Monthly Challenges and Poodles Parlour and Good Luck. Hope to see you joining us again. B E A Utiful! Thanks for playing with us at One Stitch At A Time during our girly challenge! 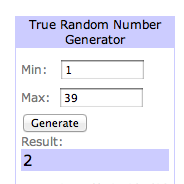 Best of luck in the drawing! Such a really beautiful way to inspire us and share your talents too! 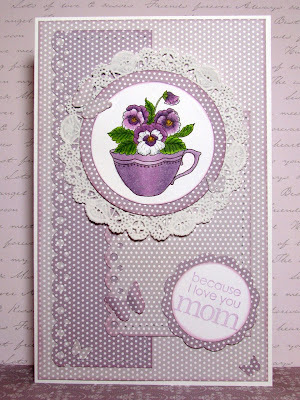 The colors are gorgeous and make for a fantastic mothers day celebration. Thanks for joining us at Top Tip Tuesday and please come back this Tuesday for another chance to join us!